I get this a lot with my system and I’ve found the same problem with Ubuntu so it wasn’t surprising. It’s some quirk of my motherboard, I pressed F6 for custom options and then added “noapic” the boot command. I’ve become used to this and have to do it on some other distros, I’m not sure how many systems are affected by the problem, it’s certainly not hard to get around but the first time you see that black screen it can be a worry for new users. It’s not a reflection on this distro though as I said and I fear it’s more of a reflection on my motherboard. I reached the live desktop and immediately noticed that the bottom toolbar was missing for some reason. The screen resolution was set at 1440×1024 and not the 1440×900 my monitor requires. Therefore the display was too big for the screen. It wasn’t much of a problem as you can scroll the display up and down by moving the mouse. I’ve seen this in other distros, I think maybe 1440×1024 is a more standard resolution and once again it may be a quirk of my hardware setup. Anyway, I proceeded to install the system via the link on the desktop. It’s pretty much the same as the Ubuntu install wizard with a Mint logo at the top and it seems they haven’t changed much here but then there wasn’t really any need to. I set up my partitions as I always do, keeping the system on a 12gb partition and the home directory on it’s own partition, I find this works well for me. Everything went fine, in a few minutes the 200gb drive was reformatted and the installation files were copying. All was well until I reached 82% completion when it started downloading additional language packs. I had the option to skip this but decided to leave it, the download was really slow and took about 10mins, after which the system froze at 90% complete. The status message said “Checking hardware”. I waited patiently for a while thinking it may finish but the desktop was locked up with no response from the mouse or keyboard. I had no choice but to kill the power and start again. I checked the disc before starting the install and it was definitely fine, I had checked it before starting originally too but you start to doubt yourself in times like this, well I do anyway. Thankfully the install went through second time around, I’m not sure what the problem was with the first attempt but these things happen I suppose. I chose to skip downloading the language packs which speeded things up a little but then I was advised that other addition packages would be downloaded. I’m not sure what all of these were but they took about 10mins to download, possibly because of network traffic but I’m not sure. Once again I had the option to skip this but chose not to, it’s not as if I was forced to download them but it took a while, probably high traffic from the new release as I said. I timed the install and including the downloads it took 17mins 9 seconds. I’m guessing if I’d downloaded the language packs as well it would have been another 10 minutes on top. Not the fastest distro install but I think there’s something else to be taken into account here, the idea of the Mint is to do absolutely everything up front to set the system up as you need it. If you take into account the time you spend setting up after installing other distros it would probably be a much fairer comparison. Either way it wasn’t the quickest install I’ve ever done and it’s worth mentioning in the interests of accuracy. On the first boot I logged into the system and was prompted by something called the Mint Setup Assistant. It basically warned me that there was no root password as such by default in Mint, I had the option to change this but didn’t. There were also a couple of other quick questions about how I wanted my desktop set up and then I was logged into the system. It’s a standard Gnome desktop really with no top tool bar and everything placed on the bottom instead. I think this is probably to give a more familiar feel to Windows users expecting the menu button to be in the bottom left. I also noticed that the standard Gnome menu has been replaced with the one from SuSE Enterprise Linux Desktop, I think it’s called the SLAB but don’t quote me on that. It basically puts everything in one large box and some people prefer it but personally I’m not a fan, it’s not a major thing really though. Just and observation. Next I opened the MintUpdate utility and I must say this is one area where you can really see how Mint distinguishes itself from Ubuntu. It seems the developers decided they didn’t like the Ubuntu update manager because it doesn’t give enough information about the packages you’re actually installing and how they my affect the stability of your system. 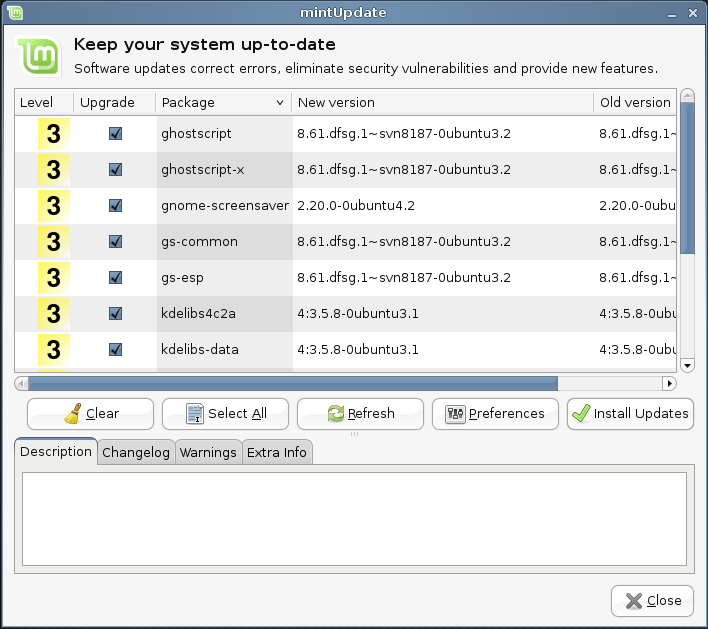 In order to fix this MintUpdate has 5 levels of risk which it allocates to each individual package. Level 1 is the safest certified by the Mint developers with level 5 being the biggest risk and usually made by third parties in the community. You can tailor the levels you wish to receive and this is a very nice touch I must say. I did find however that the updates were painfully slow to download, it was about 15kps most of the time and took an age. I did verify that this wasn’t a problem with my Internet connection but it may have been due to overload on the server. As I said earlier I was doing all of this a day after the release of 4.0 and it’s possible the demand was higher than expected but I’m only speculating. It wasn’t too much of a problem but I did have a wait. I moved on to installing some of the programs I tend to use and this is where I encountered another innovation in Mint called the software portal. This is a service similar to Linspire’s Click’N’Run or Novell’s new Build Service which allows you to install software packages from an online repository with one click. It contains some very useful software and the interface is very intuitive. 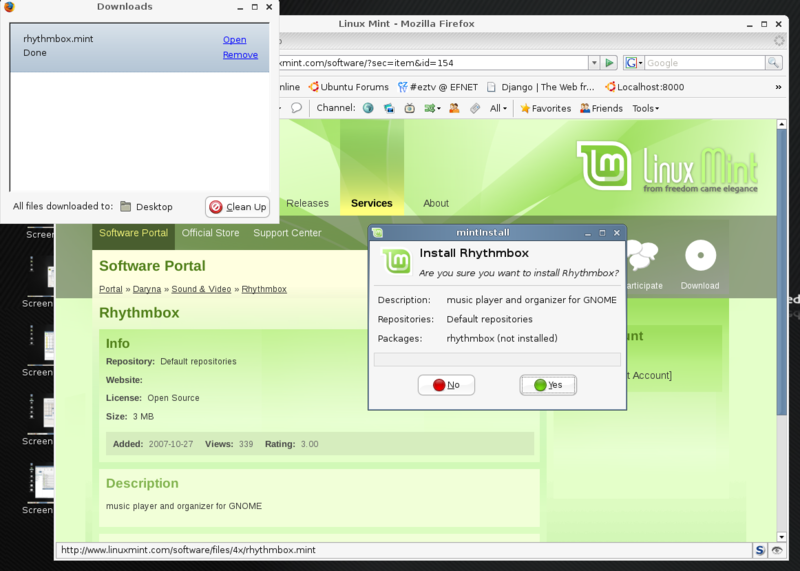 I installed Rhythmbox which is my preferred media player, also Skype and Google Earth. You just download a file with the “.mint” extension and it installs with Synaptic by temporarily changing your list of software sources, this process is known as hotplugging and is quite ingenious in my opinion. Once the software is installed your original sources list is restored and no permanent changes are made. I was very impressed by this feature and it’s a real plus for Mint I think, the choice of software available will only grow as the community gets involved and contributes. It’s very cool and is definitely a worthy match for Click’N’Run or the Build Service in my book. Hat’s off to the Mint developers on this one. I installed CheckGmail which is a tray utility that allows you to view and manipulate Gmail messages. I did this with the Tar archive on their Source Forge site and I solved the dependencies with Synaptic as I went along. It uses a few specific Perl modules I didn’t have but I found them all in Synaptic. I also installed Icepodder using this method. I opened some music and video files which all just played straight away, I also had NTFS read and write support working out of the box too. I knew Mint did these things but it’s definitely something I think new Linux users will appreciate. I have some friends who use Mint and I’d heard lots of good things about it but nothing that made me want to install it in the past, I dismissed it as just another Ubuntu clone with some codecs and drivers bundled in but I was wrong. It’s far more than that, it actually adds new features and utilities to the Ubuntu base that make it something quite different. Features like MintUpdate and the software portal make this an altogether more sophisticated beast I think. MintUpload is another feature I didn’t get much of a chance to try but basically it allows you to upload your files to shared space on the net and direct your friends to them. The files expire after 2 days and there is a 10mb size limit but it’s still an interesting feature, how much I would use it I don’t know. Probably not much but it’s worth mentioning. I still like Ubuntu but I have to be honest I wasn’t expecting to like Mint this much and I would definitely recommend it to any Linux newcomers, in fact it’s probably even better than Ubuntu in that regard. I love the one click install functionality offered by the software portal and I think this could really take off. It will be interesting to see what happens with it in the future. In many ways the Mint developers have taken Ubuntu and done with it what Ubuntu did with Debian I think. I know some people will have negative feelings about it but I don’t see this as a watering down of Debian at all, instead I think it’s a process of evolution. Yes the distribution benefits from a lot of upstream development from Ubuntu and in turn Debian all distros have this to some degree. If you have a Linux kernel and the GNU tools then you’re benefiting from upstream development, so I don’t see what the difference is. I enjoyed Mint a lot as you can probably tell. If you want a solid, easy to use distribution to recommend to your friends then you can’t go far wrong with Mint. It may not be to everyone’s taste but it’s certainly an accomplished distro and the addition of some innovative features shows the ambition of the developers to push it forward. I can’t wait to see what they do next. I’m glad you took the time to test drive Mint. Solid review and I appreciated the slide show. It’s always a pleasure to read your reviews Dan. I was just making my mind to test Mint. Even though Mint is based on Ubuntu, you seem bias towards Ubuntu. Is it a personal taste? Or do you feel at home when using Ubuntu? Please, I would be very happy to see a review from you on Pardus 2007.3 before your whole recap of all the distros that you have reviewed. and BTW you should mention about you podcast its great! Thanks for the comments guys. I wouldn’t say I’m biased to Ubuntu, I actually think having used Mint 4.0 that it’s more of a straight choice between Debian and Mint for me now. It’s cut out Ubuntu in some ways. Not based on features but based on philosophy, if you want an easy to use Debian then I think Mint is great. Glad you like the podcast Leon, I didn’t want to give people the hard sell on it but I do need to add a proper advert for it to the sidebar. It’s at http://www.linuxoutlaws.org if anyone is interested. Again, another great review Dan! Thanks! The first time I ever installed Ubuntu (7.10), it froze at 90% while checking for hardware, so it isn’t just you that had that problem. That didn’t happen when I tried Mint though, or when I reinstalled GG. I like Mint but for some reason I can’t get my printer to work on it, even though I can with Ubuntu. My mom bought a new Wal-Mart Everex $199 box that came installed with gOS. gOS is OK for the bare basics but, it didn’t recognize the EDIMAX EW-7128G PCI wireless card I had to install. I could have done some work to get it working I’m sure but, I wanted to see what distro would recognize it. Out of Gutsy, gOS, and Mint 4.0 it was Mint that recognized it and I was up and connected quick. 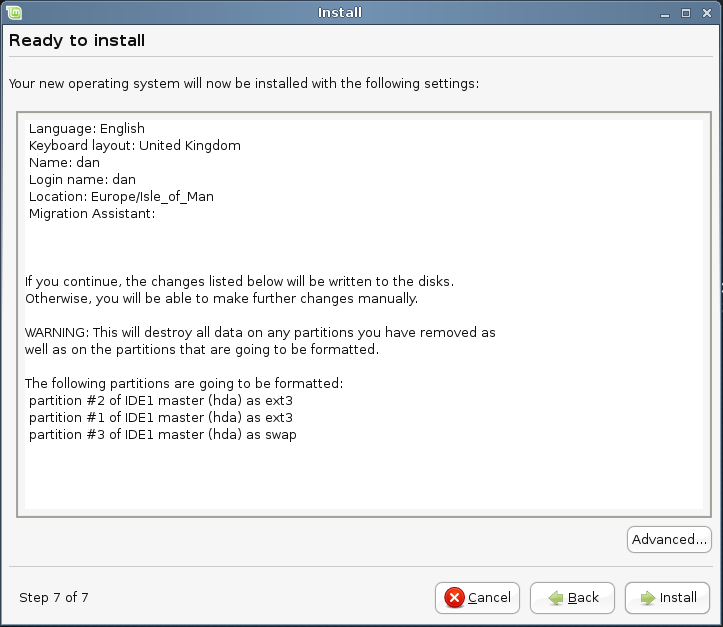 The entire install of Mint took 13 minutes on the el-cheapo but, decent box. Mint is now running great on it. I slapped and old nVidia 64MB card in it to help a bit and Mint took care of that too. 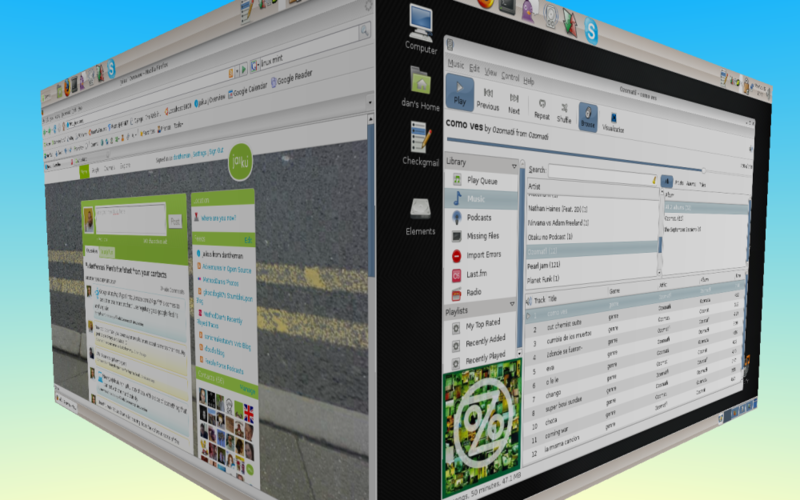 I don’t have Compiz running as she doesn’t need that but, I tell you, this little setup is pretty decent. I have a Dell 19″ widescreen LCD hooked up to it that I got for $75. $275 for a new, basic computer that runs great for what it’s intended purpose is and Mint is doing it like a champ. I love saying that my 73 year old mom “does Linux” and she does love it. I was giddy with pride watching her open the terminal and do a sudo apt-get update and then upgrade! MY MOM DOING THIS!? With notes beside her, yes! Linux is easier for her than Vista I’ll tell you that. No she’s Linux evangelist to her tea club! Thanks for the review Dan. I installed Mint a few days before this review came out and I’d like to point out that Mint comes with Envy installed. 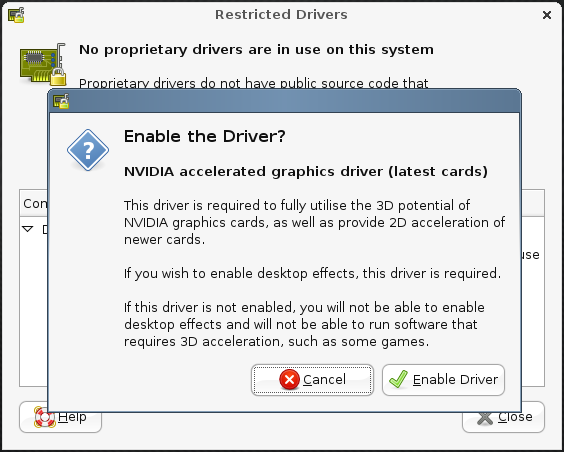 From what I understand, using Envy to install your graphics card drivers is a very very bad idea. It works around synaptic and can thus cause problems in the future. I noticed that Mint came with Envy installed but I wasn’t sure if it actually used Envy to install your graphics drivers or not. It seems to just use the restricted driver manager from Ubuntu but I can’t say for sure. You’re right in what you say though Envy does modify your sources list which could have consequences down the line. It’s a similar situation with Automatix and that’s why so many people dislike it. On a personal note, I’ve used Envy many times and never had a problem but that doesn’t mean it’s 100% safe, I’ve never been run over by a car either but I’m not kidding myself it couldn’t happen. anyway, I’m blabbing. I am in the process of researching which distros I’d like to give my attention to. Right now I’m looking forward to trying mandriva thanks to you. I’m also curious about pardus. 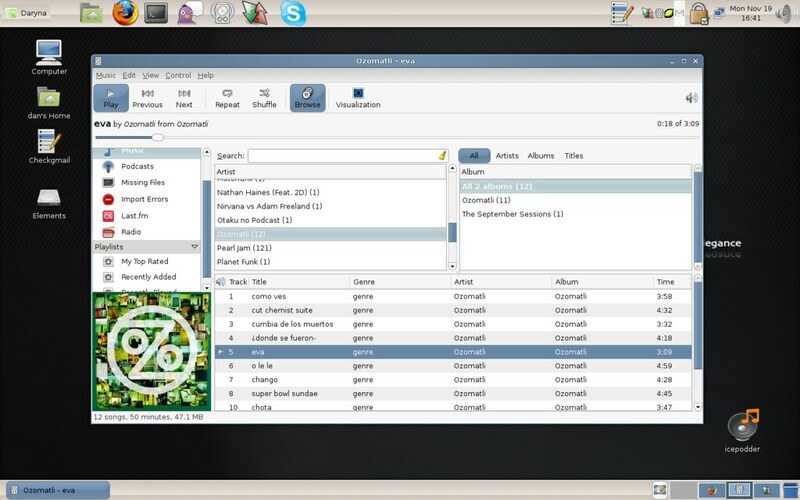 *** The main thing I want to get at though is to ask if you could review the KDE version of Mint 4.0 Daryna. I understand you’re a gnome type guy. I prefer kde and was just wondering what the differences may be. If not i fully understand. Thanks and keep up the awesome reviews! I’ve read them all up to this point so far! Thanks for the comment Donny, I’m really glad you enjoyed the reviews. I’ll certainly have a look at the KDE version of Mint in future for you but I have a few other things to get through first. I’ll add it to my list . This tutorial shows how you can set up a Linux Mint 4.0 (Daryna) desktop that is a full-fledged replacement for a Windows desktop, i.e. that has all the software that people need to do the things they do on their Windows desktops. The advantages are clear: you get a secure system without DRM restrictions that works even on old hardware, and the best thing is: all software comes free of charge. Linux Mint 4.0 is a Linux distribution based on Ubuntu 7.10 that has lots of packages in its repositories (like multimedia codecs, Adobe Flash, Adobe Reader, Skype, Google Earth, etc.) that are relatively hard to install on other distributions; it therefore provides a user-friendly desktop experience even for Linux newbies.